Copyright ©2018 by Paul Niquette. All rights reserved. For that last question, we have been offered a hypothetical Air-Race between two fixes f1 and f2, which are 290 nautical miles (nm) apart. 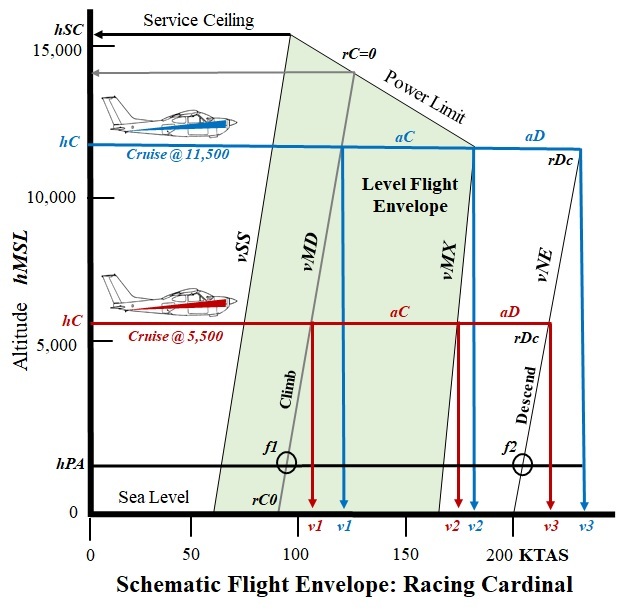 To find the answer we will analyze the flight of two identical Cardinals competing at different cruise altitudes: Red flying at 5,500 ft and Blue at 11,500 ft. 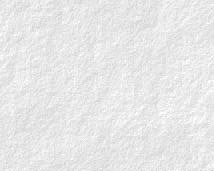 The diagram below depicts the flight envelopes for the two aircraft. The information there, along with the performance parameters provided in the puzzle, will be used for comparisons in the Air-Race. 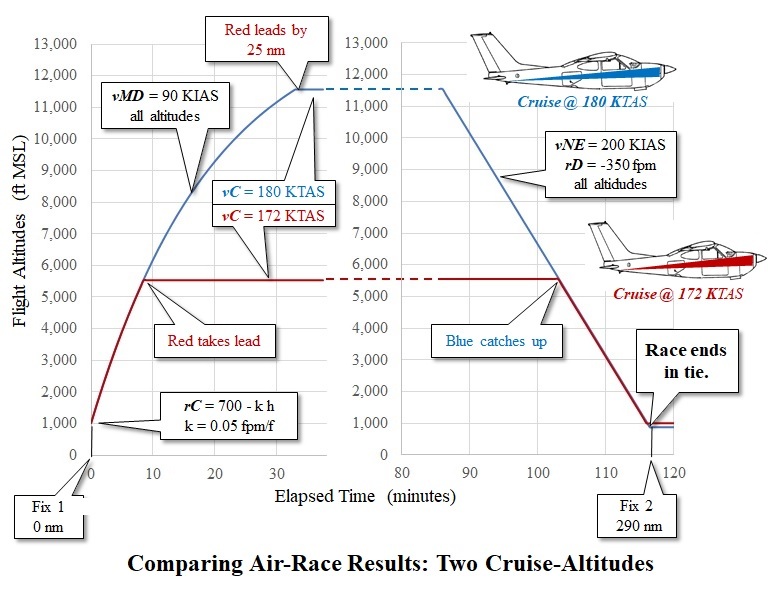 At elapsed time t = 8 min, Red reaches cruise altitude h = 5,500 ft, ending the climb at v1 = 102 KTAS and quickly accelerating at aC within the level-flight envelope to cruise at v2 = 172 KTAS. At elapsed time t = 33 min, Blue reaches cruise altitude h = 11,500 ft, ending the climb at v1 = 115 KTAS and quickly accelerating at aC within the level-flight envelope to cruise at v2 = 180 KTAS. Nota bene, at that moment, t = 33 min, Red has flown 84 miles from fix f1 and is located 25 nm ahead of Blue, which has flown only 59 nm from fix f1. Let's call that ∆xMAX = 25 nm. The comparison below was produced with a spreadsheet, applying an elementary piece-wise linear model. It shows that the altitude versus time curve is concave downward. That is the result of the decreasing rate-of-climb rC with altitude -- despite the fact that true airspeed is actually increasing with altitude throughout the climb. Later in the flight, each plane will be operating outside the 'level-flight envelope' depicted above. Solvers will notice that to minimize flight time, true airspeeds, v3 and v3 are derived from 'never-exceed speed' vNE = 200 KIAS. We see that during cruise, Blue flies faster than Red; however, even at an altitude higher by 6,000 ft, the speed advantage is only 8 knots. It would take 188 minutes -- more than three hours -- for Blue to catch up with Red. Flying at 180 KTAS, Blue will be then wind up 'down-course' by 628 nm from fix f1. Hey, that's 333 nm beyond the end of the Air-Race at fix f2. Instead, at t = 86 min into the flight, Blue begins descending for its arrival at f2. The plane commences a high-speed 'shallow dive' at full power from the cruise altitude hC = 11,500 ft to hPA = 1,000 ft MSL. As shown in the diagram above, the descent uses an assumed rate-of-descent rD = 350 fpm at all altitudes while adjusting pitch to maintain the 'never-exceed speed' vNE = 200 KIAS. Surprise! At t = 105 min, while descending through 5,500 ft MSL, Blue catches up with Red, which is just beginning its own shallow dive. Both planes will then reach Fix f2 11 minutes later, as one sees in the graph above at t = 116 min. Thus, the Air-Race ends in a tie. Sophisticated solvers are entitled to be suspicious that the puzzle was cooked up by the puzzle-master. Yet, there is at least one conclusion to be drawn from it: For such an Air-Race over a distance shorter than 290 nm, Red would win; for any distance longer than that, Blue wins. From the model we have discovered an interesting number for characterizing the performance comparison: ∆xMAX = 25 nm, which is the maximum distance by which one plane leads another in the Air-Race. It occurs just as the second plane reaches cruise altitude, from which we can calculate average speeds to reach that point: vAVG = 60 × 84 / 33 = 153 KTAS; vAVG = 60 × 59 / 33 = 107 KTAS. Reminder: Our model for the Air-Race postulated no wind. Of course, as a practical matter there is no such thing as 'no wind'. Whatever its intensity, from a breeze to a gale, 'winds aloft' have pronounced effects on flights in general and an Air-Race in particular. The graph below has been adapted from the solution to the Wind Circle puzzle. Consider the effect on the Air-Race of a hypothetical wind having a steady intensity vW and direction aW at all altitudes throughout the entire area. 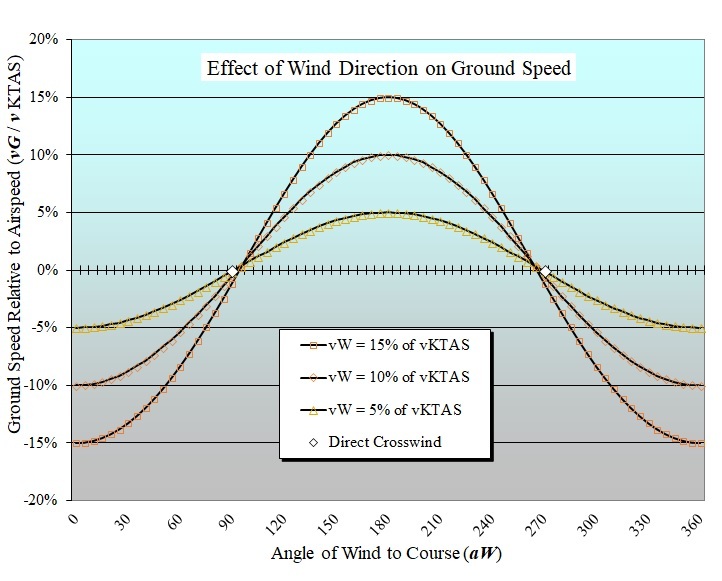 For cases of direct 'tailwind', aW = 180º, and we see in the graph that aircraft groundspeeds can be derived by adding vW in full measure to true airspeeds. For example, let vW = 18 kts, which happens to be 10% of Blue's cruise speed of 180 KTAS. If aW = 180º, then vG = 180 + 18 = 198 KTGS and vG = 172 + 18 = 190 KTGS. Likewise the average ground speeds calculated above will become: vAVG = 107 + 18 = 125 KTGS (+ 17%) and vAVG = 153 +18 = 171 KTGS (+ 12%). However, ∆xMAX = 25 nm does not change. Headwind: Use lowest altitude clear of obstacles, whatever the length of the flight segment. Tailwind: Higher the wind, higher the altitude, especially with longer flight segments. In the table below are the performance results, using 'minimum drag speed' vMD = 90 KIAS for climbing at the beginning of the hypothetical Air-Race. In ordinary flying it is customary to trim for a recommended 'cruise climb' speed vCC, optimized for engine cooling and fuel economy. To test the effects of a climb speed only slightly faster than vMD, the table shows that for a vCC = 95 KIAS, the rate of climb decreases from 700 ft/min to 670 ft/min. Thus, the time to climb, say, 10,000 ft, increases from 31 min to 33 min. We observe also that ∆xMAX increases from 25 nm to 27 nm. * measured from 1,000 ft MSL to the respective cruise altitudes 5,500 ft and 11,500 ft MSL. ** measured from the beginning of the Air-Race to the point of maximum lead distance ∆xMAX (see text). During the climb, if a tailwind is detected, the solution to the Air-Race puzzle calls for taking advantage of increases in wind speed with altitude. The table shows that climbing at vMD will hasten that benefit.